Sesame has long been a favorite flavor of mine. The oil, seeds, and tahina (sesame paste or butter) can do wonderful things to dishes sweet or savory. It is especially helpful in giving a quick flavorful sauce or dressing. When you’re looking for a dish that is quick and flavorful, but you also want healthy and satisfying, look no further. 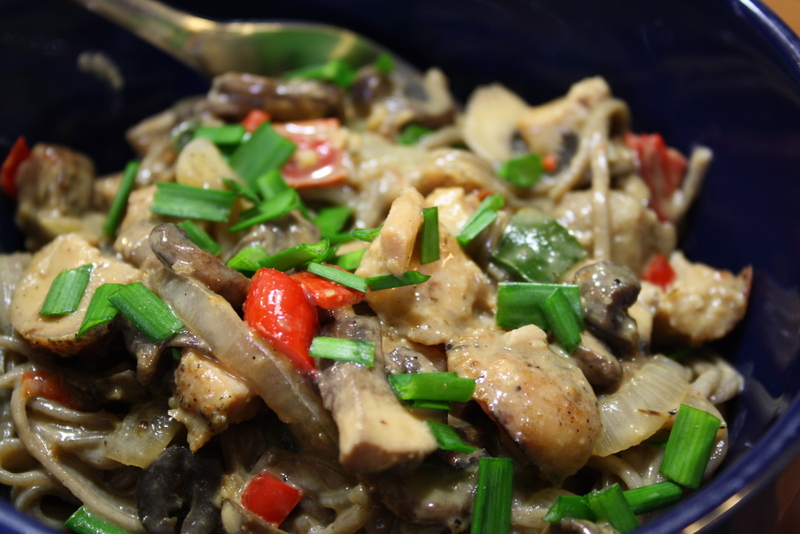 This rendition is vegetarian, but could be served with chicken, pork or shrimp. You make a quick saute of the vegetables while waiting for the water to boil. The sauce is ready in barely 5 minutes and requires no cooking. I use Soba (buckwheat) noodles for the extra protein (14 gm. per serving), but Udon or even spaghetti works well. 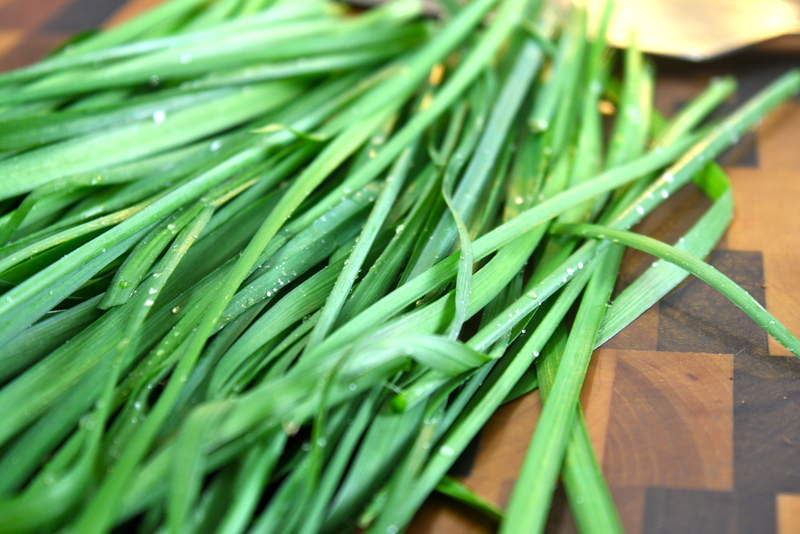 If you don’t have garlic chives, you have my sympathies. If you can grow them in your garden, I encourage you to do so; they are very hardy and can grow just about any where. 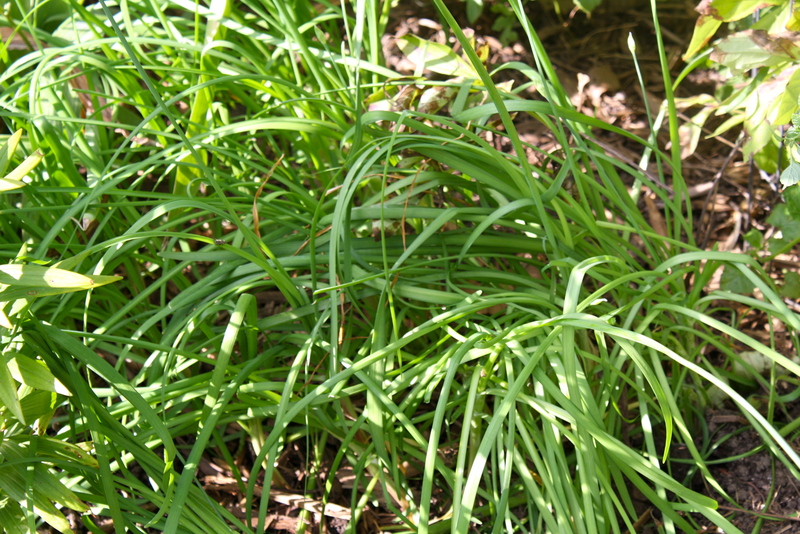 Just remember to cut off the seed heads at the end of the season…or you will have garlic chives growing in many, many places. Their garlic flavor is delicate and there is a sweet taste to them as well. Regular chives will make an acceptable substitute. Put a large pot of water onto boil. Add salt if desired. Cook noodles according to package directions and drain. While waiting for the water to boil…..
Heat a medium skillet, add a couple of Tbs of olive oil and the sesame oil. Add the onions first and let them saute for at least 5 minutes. 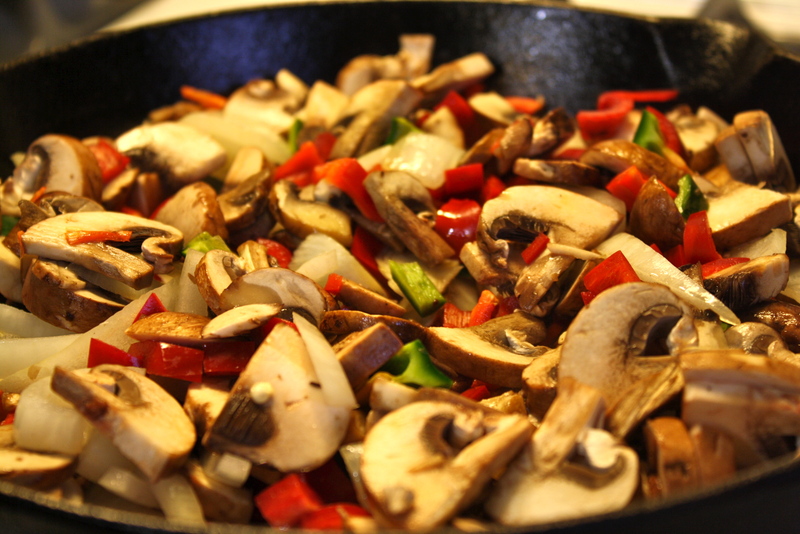 Chop the mushrooms and peppers while you wait. Add the other veg and stir occasionally while they saute. Add salt and pepper as desired. The mushrooms will yield their liquid. Continue to saute until liquid is almost completely evaporated. Combine all the ingredients for your sauce in a medium bowl and whisk until smooth. Set aside. Combine cooked noodles, sauteed veggies, half of the chives and sauce. Stir until coated. Serve immediately sprinkled with remaining chives. Enjoy!